Spoiler Space offers thoughts on, and a place to discuss, the plot points we can’t reveal in our official reviews. Fair warning: Major plot points for Hereditary are revealed below. Movie marketing has an exposition problem. More often than not, if you’re really invested in an upcoming film, it’s best to avoid trailers for it entirely, lest you risk having the entire plot laid out in front of you months before you can actually see it. 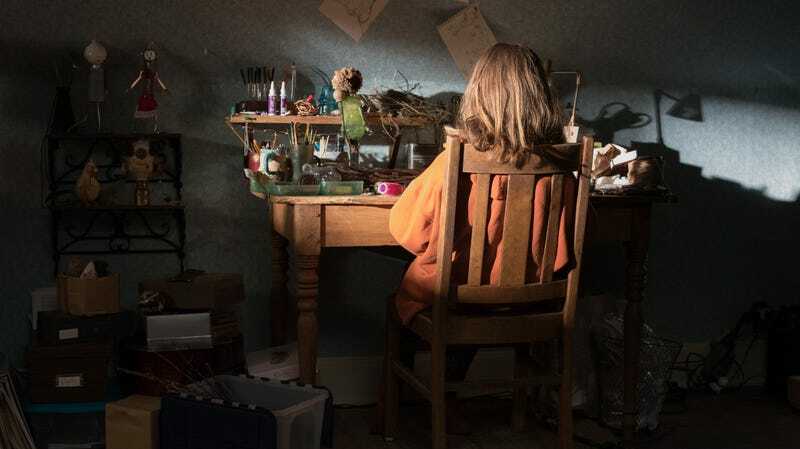 Hereditary, the newest horror title from buzzy indie distributor A24, is a rare exception, with a marketing campaign designed to throw viewers off about what to expect from the film. Critics have also formed an unspoken pact not to talk about a major twist that changes the course of the film early in the second act, creating a conspiratorial atmosphere similar to that surrounding Alfred Hitchcock’s Psycho (1960), the first movie that refused to seat theatergoers after the film had started. In fact, Psycho is one of the films that comes up when we asked Hereditary director Ari Aster about everything we couldn’t talk about in our reviews of the film. If you haven’t seen Hereditary yet, this is your last warning. Unlike Hitchcock, we can’t stop you from scrolling down unless you’ve seen the movie, but we strongly advise against it. The A.V. Club: The thing that really knocked me for a loop was Charlie dying early on in the film. It reminded me of Psycho, where Janet Leigh dies partway through and you’re just like, “What the hell is going to happen now?” How did that work for you in terms of story? Ari Aster: I mean, Psycho was the reference for that. Another reference was In The Bedroom—that was another film we were talking about—which also does this thing where 30 minutes into the film the protagonist is suddenly eliminated. And then there’s this traumatic baton passing from a main character to what felt like a secondary character. And the movie suddenly becomes unsafe, right? We’re not quite sure what we’re watching anymore. That is the Janet Leigh shower shower scene [of the film]. I feel like there’s a general complacency that comes with watching genre films. People come to these films with certain expectations. They know the formulas, they know the tropes, they know the conventions, and genre films come to feel like comfort food. Or they can, because we know what we’re there for. And there’s something satisfying about a film that satisfying the mutually understood requirements of the genre, but it can also make for very passive viewing. And it can create passive viewers. I feel like part of the fun of working in genre is that you have people in their comfort zone the minute that you establish formulas that they recognize, and that provides the storyteller suddenly with an opportunity to jolt that viewer out of that complacency and bring forth a more active engagement with the story. And in this case, I hope, a more active emotional engagement. But I think it’s always an emotional engagement when somebody is shocked, or surprised, or when viewers feel betrayed. And killing Janet Leigh the shower, that’s a betrayal. We know the score, we understand she has been set up to be a protagonist. She’s stolen money. She’s on the lam, and she’s just had a change of heart, and is going to bring the money back. She’s already redeemed herself, which is very good for audience sympathy. And then, and then all of a sudden she’s been murdered by a secondary character and now where are we? And so we’ve done the same thing with Charlie here, although we’ve established a few things with Charlie. She seems to be like a variation on the bad seed character. She’s a update on Damien, right? From The Omen. And I’m very happy with A24 for not only protecting that twist, but doing everything they can to support it by presenting this film as one that belongs primarily to that character. Because it’s not totally wrong, either. It’s like you aren’t getting what you’re there for. But you’re getting into it in a very different way. I hope that Charlie’s shadow looms over the rest of the film in a significant way. AVC: Certainly in the imagery. Which leads to another question—there’s recurring imagery of decapitation in the film. Does that have some kind of significance for you? AA: Nothing that I could articulate in a way that would be satisfying, or would help the film. I think it’s better to leave that to the viewer. AVC: I wanted to talk a little bit about the art history influences on the film. At the end of the movie, the statue with the severed heads on it reminded me of a lot of medieval art. What were you looking at in terms of historical references, demonology, that sort of thing? AA: There were a lot of different references snarled together there. We were thinking about the manger scene, the Christ manger. And so in a lot of ways, it is a sacrilegious image. You also have the gesture that you often see in Christian painting, or Catholic painting, with the the two fingers up and then the thumb. We inverted that so that the fingers are pointed downward. The statue is essentially a manikin, like a blown-up artist’s manikin—M-A-N-I-K-I-N, not like a department store mannequin. And that has its own significance. And then there’s the crown that Charlie’s decapitated head is wearing, which has sort of a fleshy texture. And behind the crown there is a halo, which is very archaic. There’s this brilliant Polish film by Andrzej Wajda called Ashes And Diamonds [from 1958] that has a very striking image film of an upside-down crucifix that has a very specific, simple, steel-pronged halo. And I just ripped that off. It always struck me as being very disturbing. AVC: Do you come from a Catholic background? AA: No, no, I was raised Jewish. AVC: I was just wondering, because it adds a little extra layer of transgression. AVC: It sounds like the way you constructed the film was very reference-heavy. With this film, or with anything that you’re making, do you start with story or do you start with imagery? AA: I usually start with images and set pieces and then from there I build a general story that can tie those things together. And then I dive into character and I really work on character for a long, long time before I go back to the story, and then I kind of rewrite the story to grow out of the people. So the characters ultimately take precedence. But the first step is finding the images that draw me to the project. Then I find story, and then I spend a lot of time developing character, and then I conform the story to the character, as opposed to people conforming the characters to the story. AVC: So what was the image that started this one? AA: It was probably a 12-year-old-girl’s head being taken off by a pole. That was one of the starting points. The other was a mother figure floating and sawing her own head off—that was a follow-up to the girl’s head coming off, like somebody who is so destroyed by what happened to her child that she must do it to herself. AVC: Wow. I mean, those are two of the strongest images in the film. Those two really stick with people, I think. AA: That’s where the movie started for me. AVC: Speaking of which, what were the logistics of shooting the scene with Toni Collette sawing her own head off at the end. Is that CGI, or did you use practical effects for that? AVC: How did you accomplish that? Was somebody rigged up in the ceiling and then you’re spraying blood everywhere? AA: That was a prosthetic neck that we gave her. It’s not her actual neck, obviously. And then we gave her actual wire that she could pull without sawing into her own neck and then we put her in a harness and elevated her 15 feet above the ground. AVC: And it’s actually her up there? It’s not a stunt double? AVC: Wow. How many takes did you do? AA: We shot that with two cameras. So there were four angles. So it was two takes, because her clothes were completely wrecked and completely covered in blood by the end. It was two extended takes, and we shot it at 17 frames per second to get the impression of an inhuman movement. So when she’s sawing fast, it looks a little bit faster than it actually is. AVC: That effect is particularly good because it’s up in the shadows, and it takes a minute for your eyes to adjust, and then when you see what’s happening, it’s just so horrifying. AA: That’s great. That’s certainly how I wanted it to play. I’m happy to hear that it works that way.